The opportunity we have at hand to shape history through our fasting is so exciting. During the dark days preceding America’s entry into World War II, some Christians gathered in England to assess the situation. Hitler had overrun Poland, Norway and France. The English Channel offered little protection from his voracious appetite for conquest. England was clearly “next” and there was no obvious way to stop him. Meanwhile, America – a slumbering giant with little appetite for another war – seemed more likely to embrace appeasement than confrontation. Russia had already made a non-aggression pact with Hitler and didn’t seem much more trustworthy than Germany. England, barring a miracle, faced a hopeless situation! The small Christian group, numbering less than 100, held little power to alter government actions. They lacked wealth or worldly influence, and had no large constituencies to call on. What could they do? How could this seemingly powerless group do anything but accept inevitable defeat, gather a few belongings, and flee? But, as patriots and devout Christians – neither of which run from their enemies – fleeing wasn’t an option. But what else could they do? As many other Christians lacking worldly power had done in the past, they could call on a higher and even more powerful source from beyond this world. As God’s children, they could call on Him! They decided to pray and added further depth to their prayers by fasting. As a community, they began continuously offering prayer and fasting to God… 24/7. They knew that if God didn’t answer, their enemies would surely overrun them. They had no power beyond prayer with which to resist. To some observers, this seemed to be a hopeless, last gasp gesture. While it didn’t appear to be much of an offensive, they covenanted to faithfully entreat and trust the Lord. They would lift their cries to the Lord – the One who alone could deliver them – every minute of every day for as long as they could. Times and dates were assigned and they began to fast and pray, first as a group, and then individually – around the clock – day after day. Early on, they were led to ask God to bring a spirit of confusion among their enemies. For a season, circumstances failed to improve. In fact, the situation seemed even more dire. The 1940 evacuation of allied forces from Dunkirk in northern France was the final blow to the defense of the European continent, resulting in all English soldiers being pushed back onto English soil. Defeat now seemed to be just a matter of time. And then… an overly confident Hitler, against the recommendations of his most trusted military advisors, and to the amazement of knowledgeable military experts, opened a second battlefront. He invaded Russia. In all of military history, there has been no greater blunder. Historians say that this is what “turned” the war. Combined with Japan’s equally ill-advised attack on U.S. Naval forces at Pearl Harbor – bringing America into the equation – Hitler’s foolish move against Russia spared England from certain defeat and occupation! Brothers and sisters – Today matters! This is so worth the effort of fasting today! And unlike a physical workout where the moment you leave the gym, the benefits of your workout begin to dissipate, the benefit of your fast and the recognition you will enjoy from having moved history’s needle – are eternal. In 5,000 years, heaven will still celebrate Pete’s effort to fast on September 12, 2018. And Susan will see every day in eternity the faces that would not be there if she had not made the tiny effort. So thank you. Allow me also to highlight for newer members something else here that is listed in the repository with each fasting reminder: Our intentions when we fast. The history here is that ten years ago America was speeding with seemingly impossible to reverse momentum in eradicating Christianity from society and moving away from all biblical leadership. And so like the Brits referenced above, as a small rag tag group of believers we began fasting for the renewal and restoration of America. We also felt gratitude to our fellow citizens who risked everything and even sacrificed everything so that we could live freely – and so we added the dual core intention of beseeching heaven to place an extraordinary shield of protection around our police, firefighters and military – that literally our tiny efforts would save lives of these courageous souls. This seemed the least we could do as many of these first responders felt that Americans didn’t appreciate their sacrifices. Fasting twice a week for them, and later broadening our fasts for their families is something we have been happy to do. Over time we began adding the intentions of fellow members in our prayers while fasting and then decided to add the protection of our members ourselves and our own families from all evil – an extraordinary blessing in itself as core to our intentions each week when we fast. We have heard from international believers in the past who asked why pray for America and not their nations. If you are fasting with us and have an important election where believers stand vs. candidates who oppose Christianity in deed if not word, let us know. We would be delighted to storm heaven with you at that time and pray for the Christianization of your nation. America however is our focus and as most international believers tell us, that is appropriate – As the only nation founded on Christian principles it certainly has been a spiritual battleground. And perhaps never has that battle been more apparent than today. Evil made a major tactical error in underestimating the turnout of believers in the 2016 election of Christian, capitalist, and American candidate Trump. In my own town of Philadelphia 250,000 falsified ballots were found and anyone who stuffed the ballot box was protected from criminal wrongdoing. Foreigners may not realize the corruption was so bad that some districts reported more votes for Clinton than they had registered voters, voters who were dead cast ballots and of course it became a racial issue to ask a black voter to present identification upon voting as if such a requirement was beyond their capabilities. The midterm elections in two months will be critical to the future of our republic. Rest assured anyone you see held up in a positive light by the media will be running with an anti-Christian agenda. And the more you see the media in complete rage over Trump’s actions and those of the candidates Trump supports, the more you know both are advancing a pro-Christian agenda. If that sounds extreme to foreigners, you may not be aware that the Obama administration highlighted a book dedicated to lucifer that advocated deceit and illegal actions of all kinds to advance an ungodly agenda on naïve Christians. Rules for radicals by Saul Alinsky became the operating mantra of Obama’s supporters and the book told believers everything they needed to know. Yet still Catholic bishops accepted bribery money of $1B from his administration and refused to speak out against him or fight his agenda. 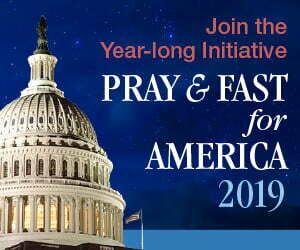 So in conclusion, as you come across believers who are concerned about America, who desire to intercede for her first responders, and who wish to unlock a revival in America that will surely spread across the globe, invite them to join us. Tell them of Jesus’ spiritual handbook on how to defeat evil and how praying Christians will lose vs. evil every time as Jesus told us – unless believers fast as well as pray. 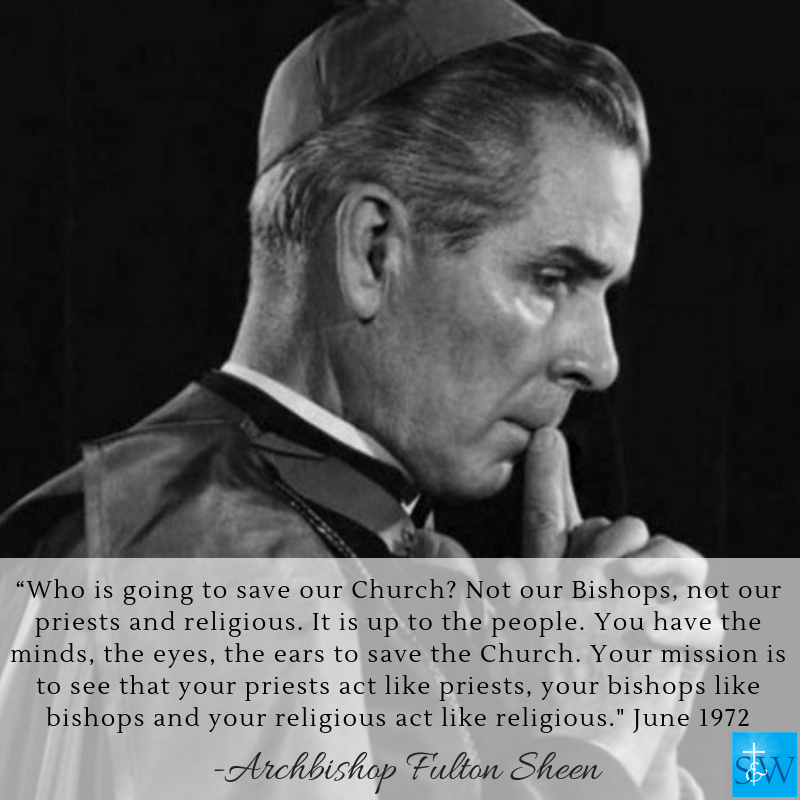 They wont hear about this from the pulpits – As Futlon Sheen prophesied, renewal will not come from the clergy – it is up to us caring enough to get involved that will make the difference. That in the name of Jesus, the Holy Spirit will descend upon American voters and lead Americans to desire God’s ways and vote God’s candidates upon our nation, electing them in even greater numbers this November at all levels of American government. Thank you for fasting with us today – You will be glad that you did for all of eternity. Join St. Joseph Partners Fasting Reminder!